5.9 earthquake hits the Ural Mountains, Russia. Two 5.2 earthquakes hit the South Sandwich Islands. Two 5.0 earthquakes hit the South Sandwich Islands. In the Atlantic Ocean: Hurricane Florence is located about 1210 mi…1945 km ene of the northern Leeward islands and about 1440 mi…2315 km ese of Bermuda with maximum sustained winds…105 mph…165 km/h. Present movement…nw or 305 degrees at 13 mph…20 km/h. Tropical Depression Gordon is located about 25 mi…40 km sse of Jackson Mississippi with maximum sustained winds…35 mph…55 km/h. Present movement…nw or 325 degrees at 14 mph…22 km/h. In the Eastern Pacific Ocean: Hurricane Olivia is located about 840 mi…1355 km wsw of the southern tip of Baja California with maximum sustained winds…115 mph…185 km/h. Present movement…w or 280 degrees at 12 mph…19 km/h. In the Central Pacific Ocean: Hurricane Norman is located about 555 mi…890 km e of Hilo Hawaii and about 740 mi…1190 km e of Honolulu Hawaii with maximum sustained winds…90 mph…150 km/h. Present movement…w or 270 degrees at 12 mph…19 km/h. Vietnam – Flash floods and landslides caused by downpours in Vietnam since late last week have killed at least 14 people, officials said on Tuesday. Four persons are missing following the floods. India – After Kerala disaster, there is another flood that India needs to take care of: in Nagaland, where 12 people have died and over 3,000 have been displaced. With the state’s road network badly damaged, basic essential commodities are either being air dropped or shipped on smaller vehicles to as far as possible. More than 13% of the state population, comprising over 48,000 families in 532 villages, is affected by one of the worst monsoon seasons Nagaland has had. A beetle smaller than a sesame seed is killing huge trees throughout South Africa, and little can be done to stop it. The polyphagous shot hole borer, a native of southeast Asia no bigger than 2mm, has found its way to South Africa and is infesting trees at an alarming rate. 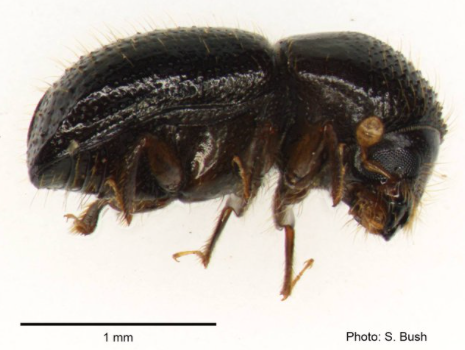 According to Professor Marcus Byrne, an entomologist at the University of the Witwatersrand, the beetle bores tunnels into tree trunks where it spreads the fungus Fusarium euwallaceae, which effectively cuts off the trees’ vascular system, causing them to die. Byrne says no one truly knows how the beetles made their way to South Africa. Kerala state health officials issued a health advisory recently due to rising leptospirosis cases and deaths in the southern state. The Health minister said there are 123 suspected leptospirosis (rat fever) cases and 71 confirmed cases, including 19 fatalities (seven confirmed). The outbreak is attributed to the ongoing monsoon floods. The Malawian government has banned the movement and slaughter of all cloven-hoofed animals following an outbreak of foot and mouth disease in the Lilongwe local government area. In a statement released on September 4, the Ministry of Agriculture said 217 FMD cases have been confirmed in five districts. The Zimbabwean government says the typhoid outbreak in the Midlands city of Gweru has spread to two neighbouring cities and triggered a surge in new cases. At least 10 people have died and 1,500 others have been infected since the outbreak hit Gweru early last month.